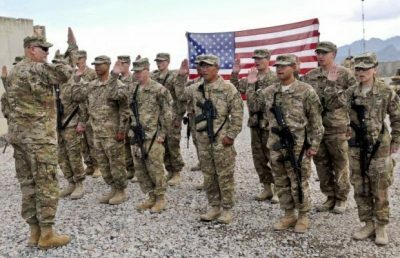 The US military is reportedly concentrating troops and military equipment at the Syrian-Jordanian border. Local sources said that about 20 US Army armoured vehicles (including battle tanks and artillery pieces) carried on trucks were spotted in Al-Mafraq. US troops were allegedly accompanied with the Jordanian Army’s 3rd Division. The US Special Operation Forces, the UK Special Operation Forces and units from some other countries -have been conducting operations across the Syrian-Jordanian border for a long time. They even had a secret military facility inside Syria where members the so-called New Syrian Army militant group were deployed. However, it was the first time when a notable number of US armoured vehicles was reported there. The US Ro-Ro ship Liberty Passion, loaded with vehicles, had arrived to the Jordanian port of Al-Aqapa few days ago. These moves followed a meeting between the Jordanian King and the US president. Thus, the US-led coalition could prepare a large-scale military operation in southern Syria. The goal of the operation will likely be to get control over the Syrian-Iraqi border and to reach Deir Ezzor. It will involve militants trained in camps in Jordan and the US-led coalition’s forces. SF forecasted a possibility of this move in the video entitled “New US Strategy Against ISIS And War In Syria. What To Expect?” in March, 2017. Meanwhile, the alleged command center of Russia, Iran, Syria and their allied forces (Hezbollah and other pro-government factions) allegedly issued a statement condemning the US military strike on Syrian forces. The statement described the attack that targeted an airbase belonging to the Syrian Arab Army as a flagrant breach of all “red lines.” According to the statement, the allies will respond to any new aggression and will increase support to the Syrian people and the country’s armed forces on all levels. “What America waged in an aggression on Syria is a crossing of red lines. From now on we will respond with force to any aggressor or any breach of red lines from whoever it is and America knows our ability to respond well,” the text of the statement reads. The statement also condemned the incident in Khan Sheikhoun and added that the Syrian military was not responsible for the alleged chemical attack. It’s important to note that the statement was released via “non-official” media channels linked to the Iranian-Syrian-Russian alliance’s forces operating in Syria. So, this is an unofficial warning to the United States and their allies. The Russian Defense Ministry and the Iranian Defense Ministry have not commented on the issue yet. Many sources suggest that the Iranian-Syrian-Russian alliance could launch a fresh military operation in order to reach Khan Sheikhoun in Idlib’s southern countryside. The control over this village will allow opening a real investigation of the alleged chemical attack in the village. Intense clashes are ongoing in the Hama countryside where the joint militant forces led by Hay’at Tahrir al-Sham (HTS) oppose the Syrian Arab Army (SAA) and its allies. Clashes were reported in the areas of Maardes, Helfaya, Mahardeh and Qamhana. Meanwhile, more and more reinforcements from the Syrian Army’s Tiger Forces and the Republican Guard arrive northern Hama ahead of the expected large-scale offensive to retake this area from militants. The security institutions controlled by Turkey in Jarablus issued an order to close all roads linking the Turkish-controlled part of northern Syria with the Manbij and its countryside controlled by the Syrian Democratic Forces (SDF) Manbij Military Council. The decision is aimed at preventing an economic cooperation with the SDF-controlled territory. The Turkish-controlled forces will also attempt to cut smuggling routes between the Turkish-controlled and Kurdish-controlled areas in northern Syria.